As a little girl, Girl in Translation author Jean Kwok emigrated from Hong Kong to New York, where—despite working long hours in a Chinatown factory—she excelled in the classroom, eventually graduating from Harvard and Columbia. 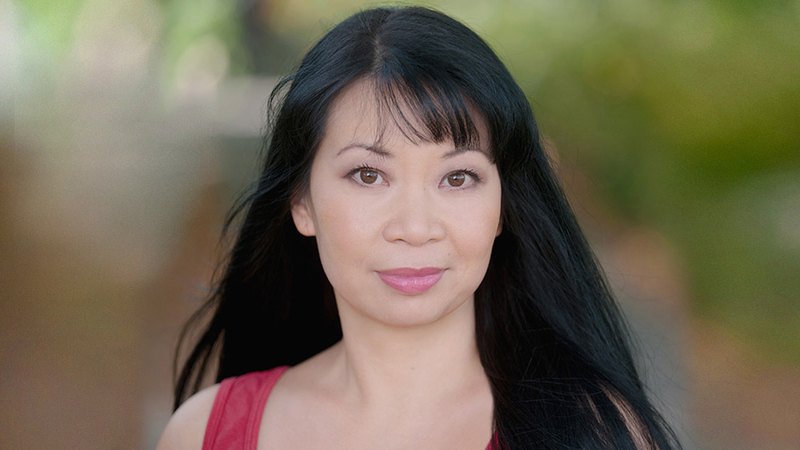 With infectious energy and charm, she comments on the American immigrant experience and ballroom dance, the subject of her new novel Mambo in Chinatown. Jean Kwok emigrated from Hong Kong to Brooklyn when she was five and worked in a Chinatown clothing factory for much of her childhood. She won early admission to Harvard where she worked as many as four jobs at a time and graduated with honors in English and American literature before going on to earn an MFA in fiction at Columbia University. Her debut novel Girl in Translation became a New York Times bestseller and has been assigned in universities, colleges, and high schools across the world. It has been published in seventeen countries and chosen as the winner of an American Library Association Alex Award, a Chinese American Librarians Association Best Book Award, an Orange New Writers title, a National Blue Ribbon Book, a John Gardner Fiction Book Award finalist, a Barnes & Noble Discover Great New Writers Pick, and an Indie Next Pick, among others. Jean Kwok lives in the Netherlands with her husband and two sons. A television documentary was recently broadcast about Jean and her work. Jean was great! The students really enjoyed her. She was so personable. Since they all had books, they were able to talk to her for a few minutes while she signed their books. The luncheon with the students went well, too. The students were very impressed with her and she had a good rapport with them. Both audiences loved her candor. The conversation just flowed…Jean Kwok was a very good match for Maryville. Her visit was quite an experience for our students, making <em>Girl in Translation</em> come alive! <em>Girl in Translation</em> is the closest we’ve come to a common read for the entire community. Thank you again for being the best FYE author Wright State has ever worked with. All our previous authors were quite wonderful, but your enthusiasm and interest in first year student success came shining through in each of the three events you participated in at WSU… Jean’s humor and expertise made her visit with an English class a home-run event. Hearing her story about children working in sweatshops was an eye-opening experience for our students. I have heard so many positive reports from students, staff, and faculty… I also heard so much praise for the way you came across so personable, so warm over Skype, and for the whole event that afternoon in general. Even the question and answer period was meaningful to the audience, and those who wanted to talk to you up close “face-to-face” via the web-cam felt it even more strongly…. It is gratifying at our educational institution that we are making a difference in their lives. Your book and YOU and your life experiences were direct tie-ins that they could relate to. You message about the value of education was powerful, as a way out of such situations as you had been in. So again, thank you! As a seminar instructor, I found <em>Girl in Translation</em> to be an excellent piece to use in conjunction with my seminar which focuses on the various elements and dimensions of emotional intelligence…. My students especially enjoyed the opportunity to hear and meet [Jean]. Her presentation helped bring the novel to life on a whole new level. For many of them, this was the first time they had read a book and then got to meet the author. They were very appreciative and proud to have been a part of such a wonderful culminating event. [Jean] is a wonderful storyteller, and her PowerPoint presentation was personal, funny, and inspiring. The eight graders found Jean’s message incredibly inspiring… they loved meeting Jean and learning from her that through hard work and determination they could make their dreams come true. Jean is truly terrific in front of a student as well as an adult audience. Jean had the ability, while addressing a crowded auditorium, to speak as if she were chatting with friends in a coffee shop. Personable, warm, funny, and brilliant, she struck exactly the right balance with her humor and her truth…. Later, speaking to my smaller class, Jean was just as powerful. Her honesty was refreshing. She’s able to be completely forthright about the rigors and realities of the writing life without being discouraging. She had the students sometimes doubled over laughing and sometimes leaning forward enthralled. They all walked out feeling inspired.